Many adults find themselves in a role as a caregiver. Caregiving may involve shopping, housekeeping, providing transportation, feeding, bathing, toilet assistance, dressing, walking, coordinating appointments and medical treatments, and managing a person’s finances. To provide unpaid care is often an act of love and devotion, but also a great drain on one’s physical and mental health. Caregivers frequently feel as though they are on call 24 hours a day, 7 days a week, which can cause great stress and anxiety. Their patients are mostly loved ones, most often a parent, spouse, or child with special medical needs. Caregivers must pay particular attention to their own needs and well-being, or they risk burning out and becoming less effective in the care of their loved one. 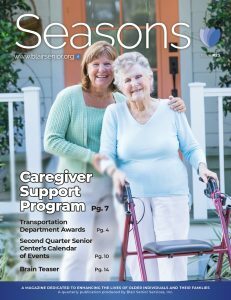 The Blair Senior Services, Inc. Caregiver Support Program is a unique program designed to provide support to these caregivers of functionally dependent people. It is unique in that it is one of the few programs targeted specifically for caregivers. The goal of the program is to reduce caregiver stress and reinforce the care being provided to the older persons at home. “The Caregiver Support Program is designed to provide assistance to an unpaid caregiver who provides routine care for a person 60 years of age or older. The caregiver and care recipient may reside in the same household or in different homes”, says Lisa Moyer, Blair Senior Services’ Long Term Living Program Supervisor. She continues, “This program assists eligible caregivers through education on caregiving techniques, information about services available in their communities, and provides limited financial reimbursement for caregiving expenses. The program would begin with a comprehensive assessment to determine which benefits best meet the needs of the caregiver and the person receiving care.” The Blair Senior Services’ Care Manager will help guide you through the process by providing information about the Caregiver Support Program, including the benefits that are available and the options you may choose. In addition, assistance may be available to caregivers of individuals aged 18-59 who have a diagnosis of Alzheimer’s disease or other chronic dementia. Caregivers who are 55 years of age or older, who reside with and care for a related adult aged 18 to 59 who has a non-dementia related disability may also participate in the program. The care receiver cannot be the biological or adopted child of the caregiver or be receiving Medicaid Waiver services while participating. Caregivers who are accepted into the program may be eligible to receive up to $300 per month reimbursement for the purchase of supportive services and goods from a pre-authorized list. The level of reimbursement is determined on the basis of caregiver need, income, actual expenditures, and availability of funds. The program can help with providing the caregiver a much needed break. For example, reimbursement of the costs of in-home respite or Adult Daily Living services is available. Caregivers may choose their own providers for the respite services – this allows flexibility for the family to hire individuals known to them, which is often more comfortable for the care receiver. They may also utilize the service on a schedule that works for their family. Some other programs require a set weekly schedule for the services, but a set schedule does not always meet the needs of every family. Adult Daily Living services provide the care receiver with socialization, meals, and daily care in a supervised setting, while the caregiver is taking a much needed break or perhaps running errands. These options allow the caregiver peace of mind that their loved one is being cared for when they cannot be there. Caregiving can be a full time job and regular time off helps to keep you well and able to serve as the caregiver. The cost of the supplies that are sometimes involved in caregiving can add up very quickly. Many caregivers find themselves spending a considerable amount of money each month on items that are necessary for their loved one’s hygiene needs, such as disposable undergarments, incontinence pads, gloves, and wipes. They also may need to purchase nutritional supplements, such as Ensure or Boost drinks, to help their care receiver maintain their weight or manage a medical issue. The Caregiver Support Program can help reimburse the cost of these items to reduce the financial burden on the caregiver. One-time reimbursements of up to $2,000 may be given to qualified families to modify the home or purchase assistive devices to accommodate the frail relative. Lisa Moyer explains, “For example, such adaptations might include installing a stair glide, a wheelchair ramp, or modifying a bathroom.” While the reimbursement may not cover the full cost of such a modification or piece of equipment, it may offset a large portion of the expense to the caregiver. Also included in the Caregiver Support Program is the Grandparenting and Older Adult Relative Caregiver Program. Lisa states, “Significant life occurrences can happen. The Grandparenting Program is designed to provide assistance to persons age 55 or older, who are caring for children (under age 18) related to them living in the same household, when their parents are unable to provide the care and do not live in the same household. The Grandparenting Program is an ongoing effort to provide opportunities and develop stronger ties with educational and child-care networks with some reimbursement of expenses, such as services and educational supplies, up to possibly $300 a month. A caregiver may receive reimbursement for services and supplies such as daycare costs, school supplies and equipment, clothing, and fees for extracurricular school activities. The Caregiver Support Program can also work in conjunction with services being provided by the care receiver. The care receiver may qualify to receive services through the Options Program for free or low cost, or receive hospice or Veterans’ services. While these services are intended to benefit the person receiving them, they also provide respite to the person’s caregiver. The Caregiver Support program can assist with reimbursing care-related costs for services not available through the free or low-cost options. Individuals participating in the Choices Program may qualify to submit the costs involved with the program through the Caregiver Support Program. Choices provides a wide variety of privately paid service options that are not available through most other traditional programs. For more information about the Options or Choices Programs, please call Blair Senior Services, Inc. at (814) 946-1235. Did You Get Your New Medicare Card?